Above: Plomari, 1948. Standing are: her sybetheroi, Persephone and panagiotis, her sister, Persa, unknown and Maria herself. 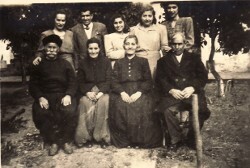 Seated are petherika (in-laws), Georgios and Amerisouda, and her parents, Ameerisouda (Mersini) and Grigorios. 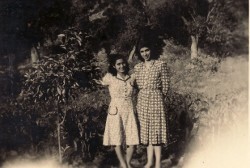 Above Right: With her sister, Persa. 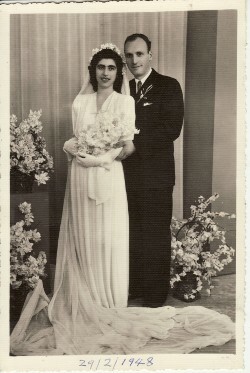 Above: With her husband, Apostolos, on their wedding day. Above Right: Stopover in Sydney; on her way to New Zealand. 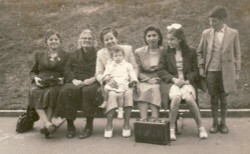 L-R: Irini Asproloupos, Barabara, unknown, Maria herself and, Marina and Mihail Asproloupos. Above: Horianoi in Wellington. 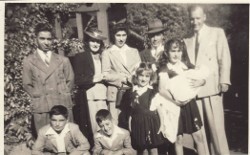 Standing are: Dimitrios and Pelagia Geragotellis, Marika herself, unknown and her husband, Apostolos. In the front row are: Ioannis, Georgios, Persephone (Nitsa) and Persephone- holding Georgios.